I’ve just done something a bit different, and maybe crazy. I put my entire new novel up on wattpad. Yes, I am. And maybe I am. Over the past few years, I’ve spend a lot of time in schools touring the MetaWars novels. Doing school visits is an honour and privilege, and it gives me an unique POV on my readership. I actually get to meet my readers, talk to them. Not many creators get to communicate directly (in person) with their audience, solicit feedback and generally chat about their lives. One thing I observed is that in the UK, as a white dude from Canada, the modern UK student body is incredibly diverse. I’ve met students from all around the world; some new to this country and others many generations in. But one thing they all had in common is that the books they have access to tended to be fronted by, yep, white dudes and gals. They’re reading Harry Potter, Wimpy Kid, Anthony Horowitz books, and The Hunger Games. I noticed a pattern, many students did not have their ethnicity reflected, or their culture celebrated. This was most apparent to me with students with Indian heritage. In parallel, I was fortunate enough to return to India (I worked there over ten years ago, when the ‘Choose Your Own Adventure’ movie was in production) and relish in the culture. When I set out to write a science fiction story about family….about turning the notion of family on its head, I knew it had to reflect the diversity I saw in schools and the diversity we should all expect from our future. The book, which has become STAR PRESSED, is my attempt to do what Gene Roddenberry did in the 60’s…introduce intergalactic diversity in an organic way that feels completely natural to the narrative. STAR PRESSED is set about 250 years in the future, when India is the dominant political force on the planet, and operating as a “reverse Commonwealth” has colonized space. So, who do we meet there? – Tez is an “ethnic Martian” who comes from a mono-sexual culture, totally disgusted by humanity’s dual-gender breeding. – Rys is an entitled Egyptian, like a young King Tut, from Egyptia…the planet that first placed the pyramids on Earth. – Captain Nayar was once a fast-jet flyer for the Indian run Galactic Navy. Now injured, he’s in a broken hover chair, serving as a surrogate father to five young people he’s not related to. How can something be too diverse?! 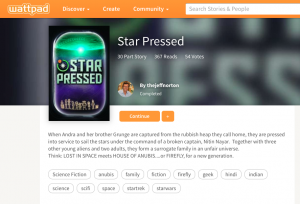 If I couldn’t get STAR PRESSED into print form because it was too diverse, I could go directly to readers via the wattpad platform. 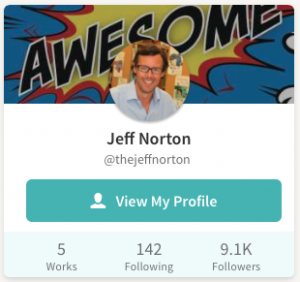 Now, spirit of full disclosure, I’ve been a long time fan and friend to the wattpad folks. They’re based in Toronto (my home town) and I have a great affinity for what they’re doing. My MetaWars publisher, Hachette, gave me permission to put the first MetaWars novel up on the platform and it’s had an incredible response — building a new audience, spurring ebook sales of the sequels, and giving the characters a new global window. As you may know from following this blog, I’m not just an author but also a TV creator and producer. In parallel with writing STAR PRESSED as a book, I’ve been secretly huddled over Final Draft writing it as a script for the telly. I’ve just started to share it with potential co-producers and broadcasters and the appetite is rabid. 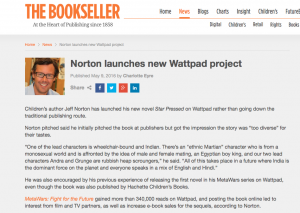 My hope is that readers discover STAR PRESSED on wattpad, enjoy the book and that at the same time, I’ll be charting the long road to turning the book into a show, which will then ignite and excite a whole new group of readers. If that happens, hopefully print publishers will see diversity as an asset, and not a liability.